Can you believe that the week of Halloween is finally here? By this time next week everyone will be in full on Thanksgiving and Christmas mode. It is crazy sometimes to think about how the days just fly by so fast and then the next thing you know you are looking back like that was really that long ago. If you have kids then you know exactly what I mean. You can see the days go by in how dang fast they grow. I swear my daughter has grown 2 inches in 2 months. She will be taller than me by the time she is 10 i’m sure. #shortpersonproblems! Now that I have rambled enough the point of this post is to take a few minutes and enjoy some time with your kids. 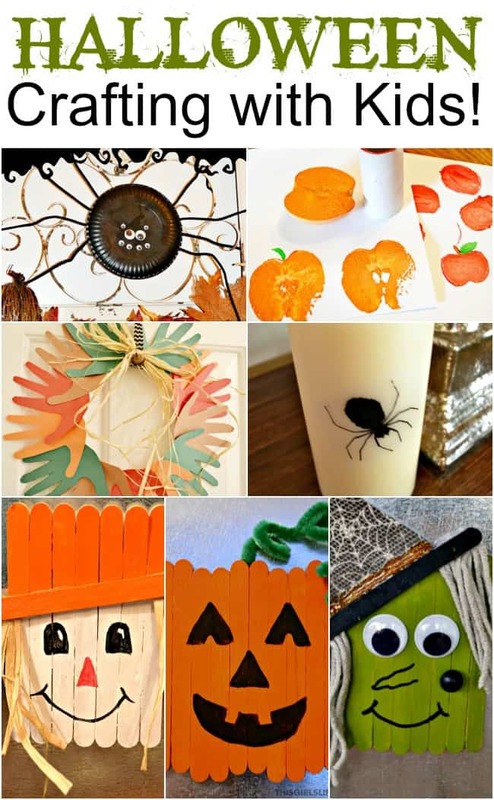 This a round up of all my Halloween crafts in the Crafting with Kids! series in case you missed any. They are all quick projects, probably 30 minutes or less for the majority of them. What are you waiting for? Put on one of your favorite Halloween movies and get to crafting. 🙂 I hope you have a fun time Crafting with your kids this week. I will be posting up more Thanksgiving and Christmas crafts as the weeks go on so that you and your kids can enjoy crafting right through the end of the year. Nice round up. Just popping in from twitter to say hi. Have a great Halloween with your family!